The British designed and built, JCB Skid Steer Loaders are great fun to drive and race. There really is nothing quite like roaring around the Diggerland course in these specially adapted machines, and swerving and sliding left and right through the slaloms whilst trying to avoid clocking up time penalties by hitting any of the course markers. With Dumper Racing, the emphasis is as much about getting around the course penalty-free as it is on speed, so do not worry if you are not the first to cross the finishing line… the chap or “chapess” in front of you may still lose if he or she has accumulated enough time penalties. Each race heat is between 3 or 4 “F1 wannabes”, and then the winners of the heats go head-to-head to determine the event’s overall winner. 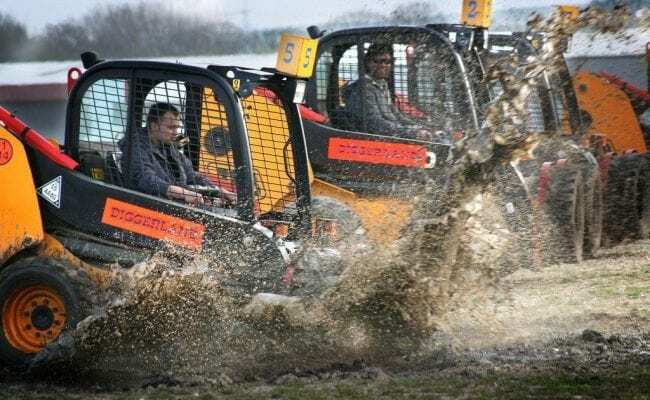 Fun and friendly competition are what DIGGERLAND Dumper Racing is all about. So go on… what are you waiting for? Race in a minimum of 2 heats and, should you make it that far, in the final to race to become the Champion of the Event! Once booked in, we require at least 21 days’ notice in writing to[email protected], should you wish to make any date changes.